This class is a followup to the popular WordPress 101/WordPress for beginners class, although that class is not a prerequisite for this one. Some basic WordPress knowledge would be useful, but is not required. 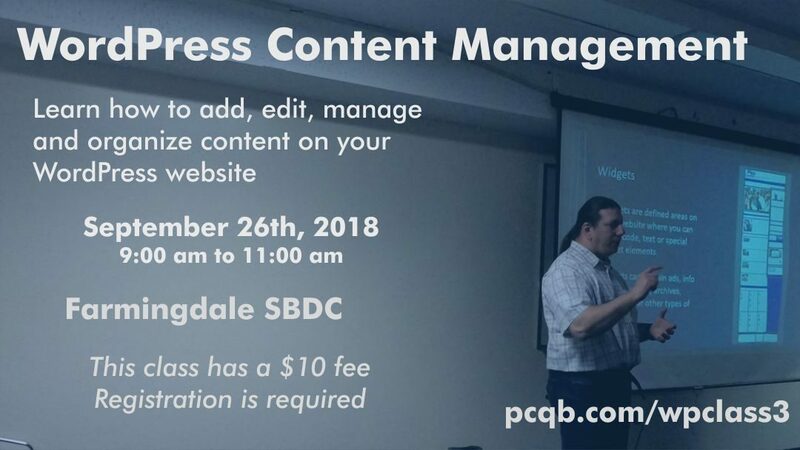 Topics covered in this class will include: adding content to your WordPress site, creating posts and pages, working with categories and tags to classify your content, some tips on working with the WordPress media library and how best to use, obtain, modify and upload images. The previous version of this class combined content management and site management, but that proved to be too much to cover in two hours. A class focusing on site management and administration will be covered in another class that will be offered in 2019. The class will be given on Wednesday, September 26th, 2018 from 9:00 am to 11:00 am at Farmingdale State College SBDC Conference Center. There is a $10 fee for this class. Registration is required.